Over the past week I’ve seen a number of articles and videos about the shouting-down of journalist Caroline Fourest at a Belgian university. Unfortunately, all the stories were in French, so nothing about the incident was posted here. Takuan Seiyo has kindly written an account for Gates of Vienna about what happened, based on French-language sources, and includes a selection of relevant photos. Accused of “Islamophobic racism,” the French writer-journalist Caroline Fourest was shouted down and prevented from speaking during a debate at the Free University of Brussels (ULB) on February 7th — though it was ULB that had invited her to discuss the “extreme right” in the debate. Fourest had to be whisked away by a security detail, to protect her from the wrath of some 40 Muslim partisans. Hold it right there. I know that un-PC speakers and writers who have been silenced and menaced are fighting for freedom of speech. But a society that wants to survive does not practice freedom of speech. Are there debates about the divinity of Jesus at universities in Saudi Arabia? Or about the merits of the British colonization of Hong Kong at universities in PR China? In the one, they want to remain Muslim; in the other, materialist-Confucian Chinese. Which should be fine with us. That we hold debates about Islam — a profoundly alien, lethally hostile ideology — and the integration of its practitioners in Western society, is a symptom of dementia that I would diagnose as compulsive cognitive Onanism. A nation that admits all ideas for endless debate believes in no ideas, and has no will to live. Furthermore, the official name of the debate was “L’extrême droite, est-elle devenue fréquentable?” which translates loosely as “The Extreme Right; has it become touchable?” The debaters were Caroline Fourest and Hervé Hasquin. The moderator was Guy Haarscher. 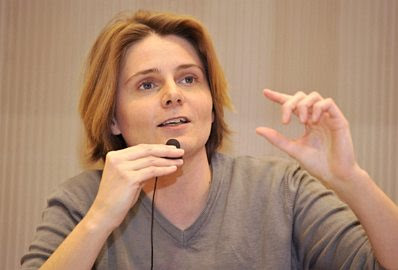 Fourest had taken positions critical of Islam, but she is a feminist, gay, anti-religious and anti-“racist” writer-activist who has criticized Tariq Ramadan, but also Marine Le Pen. Hasquin is a Wallonian politician and ULB historian well known for his liberal-secular views. Haarscher is a professor of law at ULB and to judge by the theme of his books (e.g. Karl Marx, Georg Lukács, Human Rights Law) no raving Rightist. So who was representing the “extreme right” in this debate? If it’s either one of the three, that makes Leon Trotsky into “moderate right” and Pol Pot into “moderate left.” For ULB to shift the goal posts of “Extreme Right” in this way and to insinuate that it is untouchable makes mockery of the protestations of freedom of expression by the white post-Christian suits who represented ULB and the putative forces of reason in this event. Lastly, nothing is “free”: neither ideas in the PC/MC/neo-socialist Belgium nor the finances in a taxpayer-supported university. So the very name of ULB is sophistry. The video embedded at the above link, and others posted on YouTube, are disappointing. One can’t see what Caroline Fourest was trying to say, there are ULB old suits on the stage addressing the young Mussulmans in the back who cannot be seen or heard clearly. Plus, concerning the latter neo-Belgians, it’s hard for me, having been taught classical French when Europe was still European and its civilization mattered, to understand their neo-socialist/mussulmanist Belgian duckspeak bouncing off bad acoustics. Apparently they were shouting Burqa bla-bla and various invectives. Who is Souhail Chichah, you will ask. And, if you still possess your own relatively uncontaminated brain, Why are there Belgians named Souhail Chichah? Mr. Chichah is apparently a “Researcher in the Economics of Discrimination” employed by the University of Brussels on the melting euro of the much-abused Belgian taxpayer. The name implies Maghrebian origins and the face… well, I’ll leave it at that. Chichah was among the organizers as well as chief disrupters of this event, which is not surprising. Rationality, aptitude for reasoned argument, speech at bearable decibel levels unaided by wild gesticulation, these are the Euro-peoples’ traits developed over many centuries. They cannot be stapled automatically into each Eurabian passport. Which explains why the West’s ruling Body Snatchers who inflicted the Chichahs of this world on their serf populations came up with the necessary slogan that diversity is beautiful and, to complement that, indoctrinated three generations of autochthon students in the politics and manners of outraged useful idiocy. Chichah had distinguished himself in the past by vociferous support for another symbol of the blessings of Eurabian diversity, an Afro-Islamic French anti-French clown named Dieudonné. 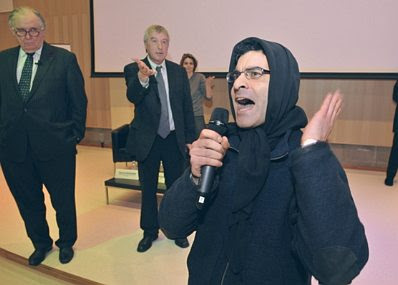 The Belgian anti-Belgian “Researcher in the Economics of Discrimination” had signaled in advance in social media postings that he would organize a “stoning” of Caroline Fourest that should be joined by other Muslims in a display of “Burqa Pride.” Chichah’s partisans, relays the Belgian newspaper, express, like him, hate toward Israel and toward “Whites” (Le Soir‘s quotation marks, as though this were some bizarre, unheard-of term). In a coda to this little drama, the ULB Alumni and Students’ associations condemned the Burqa bla-bla thing, expressing their “shame at the fascist methods in a house of Free Inquiry.” They and Prof. Haarscher invited Caroline Fourest to come back, and promised better protection. But Fourest said that she’d not come back, as she had been to conferences all over the world, and nothing of this sort had happened to her except in Belgium. All of which leaves me with an odd taste, as though I’ve just bitten into a gypsum apple. Or witnessed the Queen of Hearts’ croquet game in a postmodern Wonderland. You know, with dhimmi-socialist premises and their practitioners as hedgehog balls and flamingo mallets, imported soldiers of Islam as both wickets and executioners, and the Mad Hatter making an appearance at the end to express his incomprehension why the event went awry, and singularly so. 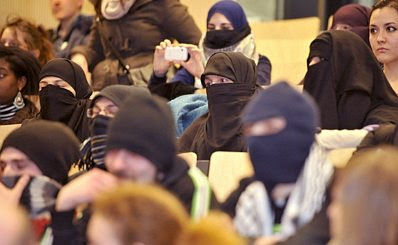 For variations of the Burqa bla-bla operetta are performed regularly on university campuses across the West. In March 2009, the conservative columnist Don Feder was the subject of one at the University of Massachusetts at Amherst. In his case, the speech-nullifying bla-blaists were white lefto-homo-antifa zombies. A piquant detail is that Feder is Jewish, and one of the main hecklers wore a keffieh. In February 2010, the Israeli Ambassador to the U.S. was heckled and prevented from completing his speech at UC Irvine in California. 11 Muslim hecklers were arrested. In the name of, of course, “avoiding divisiveness” and “healing”, 100 voluntary-dhimmi UC Irvine faculty members petitioned the District Attorney not to prosecute the hot-and-zealous protesters. First they import the agents of divisiveness and then they lean on the victims of divisiveness. No healing will ever be possible for idiots who have shot themselves in the head with their own hand. “Ann Coulter speech cancelled after thousands protest,” ran the Toronto Star headline on March 23, 2010. “Ann Coulter causes firestorm in Canada by telling Muslim to ‘take a camel’ as alternative to flying,” ran the Daily News headline a day later. Coulter was scheduled to speak at the University of Ottawa as part of a three-stop Canadian tour that started at the University of Western Ontario and would end at the University of Calgary. The events had been organized by the International Free Press Society in collaboration with conservative student groups on each campus. Coulter is a professional provocatrice (from “to provoke”), sort of a white equivalent of Dieudonné, except much more accomplished and easier on the eye. So on her first stop, at UWO, she told a pesky Muslim student to “take a camel” instead of the flying carpet she had previously suggested Muslims use for flight transportation. Even before she arrived at the next venue, in Ontario, Coulter received a warning from the University of Ottawa provost, warning her: “Promoting hatred against any identifiable group would not only be considered inappropriate, but could in fact lead to criminal charges.” Ottawa’s police and university security advised of physical danger to the tall and politically provocative blonde. Ezra Levant, who along with Mark Steyn knows a thing or two about Canada’s whitey-only speech clamps, then advised Coulter to cancel her appearance. Which she did, but the riot erupted nonetheless, ubiquitous keffieh, screaming and all. That Visible Minorities (as they are called in Canada) and their white Progressive amen corner are offended by Coulter is one thing. But how many screaming, screeching, violence-inflicting white Frenchmen, particularly Jews, silence in riotous manner the offensive anti-white, antisemitic provocateur, Dieudonné? How many gross acts of violence and intimidation by Muslim and dhimmi-Socialist campus zealots against pro-Israel Jewish and Christian students were prevented or adequately punished by solicitous campus administrators? Notice to ULB: next time you want to discuss the “extreme right,” invite a representative of its mildest strain, Ann Coulter. "This is widely viewed as a significant step forward in OIC efforts to advance the international legal concept of defaming Islam." The famous "take a camel" remark is an example of the basic but profound insights that make Coulter far more than a provocatrice. It is not out of any standing inclusion of flying carpets and camels as forbidden subjects that this suggestion was deemed so inflammatory. The simple fact is, those who demand the abolition of Western Civilization simultaneous with untrammeled access to the goods it has produced must be confronted with the central contradiction they express in such demands. And it was by pointing out, in terms that cannot be refuted by any appeal to rhetoric, this contradiction that Coulter incited the fury of the Islamists and their multi-cultural defenders. Islam didn't fail to invent the airplane and develop a system of rapid international transport based on that technology out of any lack of imagination or desire for such a thing. Islam failed because actually accomplishing such advances in the level of human prosperity and technology requires cultural values and freedoms that Islam forbids and crushes (with great brutality). Of course, the fact that Coulter parses her very pertinent observations in such "accessible" idioms has long been a demerit of her style of discourse in my own view. But then, we have reached the point where it is the observations she makes rather than the manner she chooses to make them which provokes violence outrage. And that is far worse than any slight to my personal sense of aesthetics. It is a sign of impending doom. Still, as long as there are some people who use their wit to observe reality rather attempt to obliterate it, then there will be survivors no matter what the catastrophe. I would always prefer more, but that is up to each individual person to decide. Fourest had to be whisked away by a security detail, to protect her from the wrath of some 40 Muslim partisans. Now there is the problem in a nutshell. Before multi-culti, the 40 hooligans would have been arrested and 'whisked away', not the speaker. Hell, they wouldn't have been let in at all if masked! Several years ago I had a son at a state university here in the US. 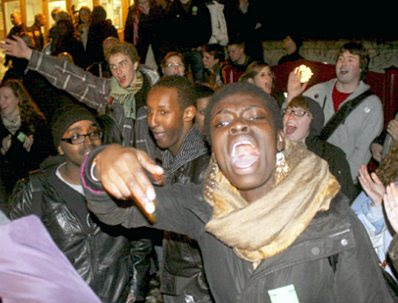 A religious pastor was invited to speak and there was a great uproar in the campus community. Battle lines were drawn and students were organizing to disrupt the talk. My son asked me what I thought of that. I told him to hand out little spiral notepads with which the people that thought they disagreed with the speaker could make notes during the speech. Then, they could go to the microphone and challenge the speaker on what they just heard. In other words, engage in a civilized debate on the issues; not shout the person down, throw pies or even bar the person from speaking in the first place. PS: I have no idea whether I would have agreed with the speaker or not. But, isn't that just the point? Cordiality is one thing. The intellectual capacity to make a reasoned counterargument is something else again. Like I said before, no matter how politely Coulter might have put some of the things she says, they are innately offensive precisely because the opposition lacks the intellectual resources to make a reasoned answer. In some cases this is because no reasonable answer exists, but in others it is simple deficiency of intellect. One can argue about where exactly the line must be drawn. For the case of Islamic culture inventing their own technology and infrastructure for air transport...yes, it would be a substantial effort beyond the intellectual, but the relevance of the intellectual underpinning cannot be dismissed easily either. It is one thing to offer an opportunity for civilized debate to someone that has a good chance of making their points in one. It is not quite the same to offer it to someone that has no points to make and lacks the intellect to make them in a civilized manner. Of course, one can make the offer without knowing which is the case, and then learn from the reaction what the person thinks of the reasoned merits of their own position and their ability to articulate it. But people who have chosen to respond to civilized debate with noisy threats of violence are likely to have done so for a reason. Masked males or females do not belong in a civilized society. I would say that, in a really civilized society, it is hardly anyone's business whether you're wearing a mask or not. The problem is when we refuse to punish criminal activity because the perpetrators were wearing masks. Of note, regarding the Ann Coulter case, is that she was threatened with legal procedure BEFORE giving any speech. I bet if she has spoken about cuisine or fly fishing, it would still be considered hate speech. Criminalizing feelings... how's that working out for us? Every last incident of speaker intimidation on North American campuses (and there have been hundreds) are of a conservative speaker. No left wing invited speaker has been called names, shouted down, jostled, pied, or gotten bomb or death threats, not even the execrable Ahmadinejad of Iran. And yet who preens about their moral superiority and pretends it's non-violent, against censorship and wants to promote dialog? - the lying projectile throwing Left. Why they're not laughed out of polite company as the barbarian hypocrites they are is beyond me.